With this much power on tap, the roost is prodigious! Even the front smoothies are throwing sand like crazy. 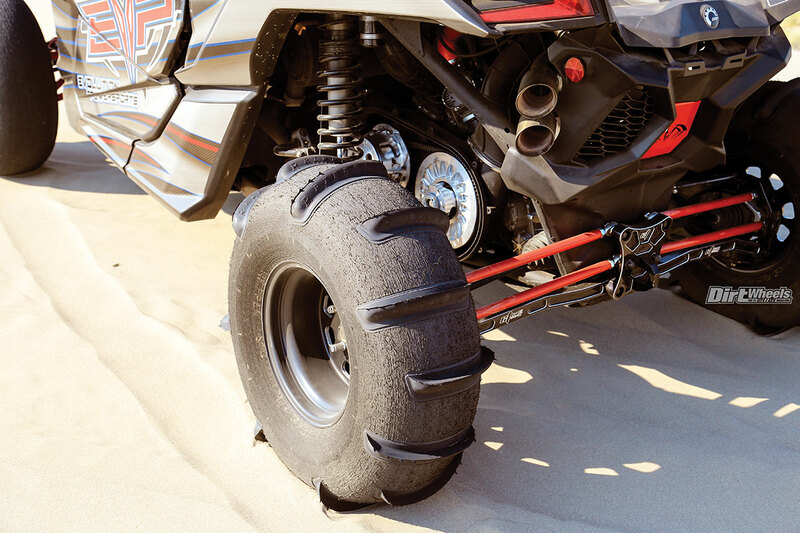 This power makes dunes feel small. 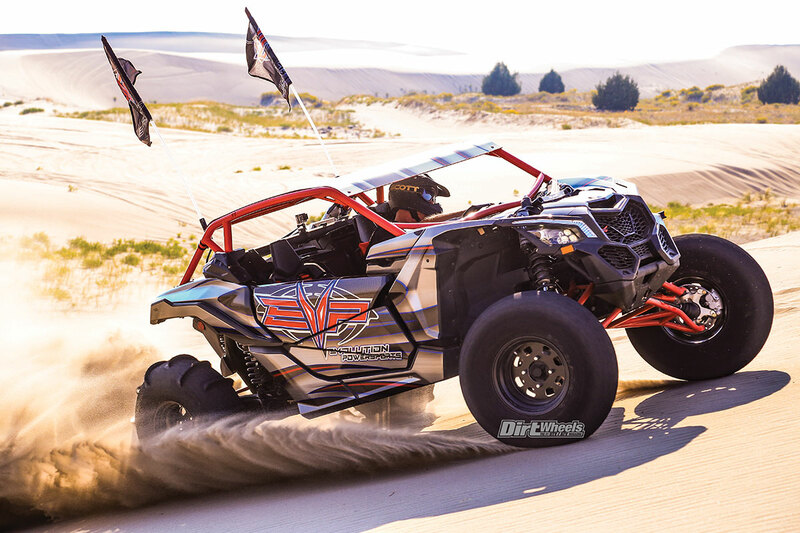 Recently, we have found ourselves getting seat time in a variety of machines with Evolution Powersports turbo modifications. Traditionally, when you start leaning hard on a motor and making a lot of horsepower, the power delivery can get finicky and lose drivability. When we first caught sight of the Evolution Powersports X3 in Idaho at the UTV Invasion, it was the look of the car that grabbed us. Later, though, when we strapped in, turned the key and hit the throttle, it was the 252 horsepower that grabbed us! When we started investigating the car, we were surprised to see that this ultra-powerful X3 runs on E85 fuel. We thought that was an eco fuel more for emissions than power. It does have ethanol in it, and it turns out that the cooling effect of ethanol is perfect for turbo applications. Evo made sure the whole catalog got involved in this build. The centerpiece is the Stage 6 billet-wheel big turbo that replaces the stock turbo with one that is larger and more effective but still uses the OEM exhaust housing. The kit includes 3.0 Bar Map sensors to replace the stock Map sensors and a high-performance waste-gate actuator. The Stage 6 Sandblaster kit requires high-flow fuel injectors and a high-flow fuel pump (for 2017 models), an exhaust system, boost hoses and an intake kit, plus a blow-off valve. These latter parts are not included in the kit. You will also need a performance software calibration and a Maptuner X is recommended. Evo rates its kits by rear-wheel horsepower, and the Stage 6 Sandblaster kit is 240 horses on 110-octane race gas and 252 ponies on E85. The stock X3 is rated at engine horsepower, so, according to most tuners, a stock X3 is around 140 horsepower to the rear wheels. We can tell you that anything making 200 (or more) rear-wheel horsepower is a monster. Basically, Evo makes changes to every part of the intake and exhaust system that is outside of the engine. It opens the intake, adds larger fuel injectors, uses a bigger turbo that pumps more into the engine and then opens the exhaust to finalize the breathing improvements. To deal with all of the added power, both clutches are replaced with stronger billet parts from STM. Even without tread of any sort on the front tires, the turning is quite good. The buffed tires and spun-aluminum rims make a light package. Adding this sort of power to a stock machine doesn’t make safety sense. Evo started with a stronger roll cage from S3 Powersports. It added lower doors from Can-Am’s accessory division and four-point harness-type seat belts from Pro Armor. The stock Can-Am seats are plenty supportive and comfortable. Heavy-duty lower A-arms, radius rods, upper front shock mounts and the rear radius arm plate were all sourced from CT Race Worx to make the suspension system ready to handle the added power and acceleration of the X3. The A-arms and the lower radius rods are arched to provide more clearance, in addition to being stronger than stock. To further increase reliability, a Sandcraft Gen 3 carrier bearing to support the front drive shaft was installed. It has a grease Zerk to service the bearing, but it can have a remote hose installed to make it easier to grease the bearing. STM Powersports makes these incredibly tough and precision-made high-performance clutches. Evo runs them uncovered in the sand. As we said, the look of this machine is quite striking. A variety of parts were powdercoated red, and a custom Wolf Designs wrap gave the rest of the body a truly standout look. While they look cool in a rugged, purposeful race-look way, the CMS wheels are super light, and they mount big and burly buffed Skat-Trak sand tires. The buffed rear has 14 paddles affixed, and that is a big number for powerful cars. The fronts are smooth-buffed, but as you see in the photos, they still pick up and throw a lot of sand despite the lack of tread. Finally, Quick Light LED whips were added, with Evolution Powersports flags flying on them. If you are building a Can-Am X3 to showcase how powerful your engine parts make it, it makes perfect sense to keep the car light. That is precisely what Evolution Powersports has done here. Nothing is added that isn’t required for safety. And for a car that primarily sees only sand, there isn’t much need for skid plates, rock sliders and bumpers. Skat-Trak’s 32-inch Ripper paddle is a monster. It takes power to use a tire with this many paddles on it. The fronts are buffed smooth. This Can-Am Maverick X3 has acceleration best described as brutal. Like most X3s, the low-rpm pull-away from a stop is not that impressive, but as the rpm climb and the exhaust heat gets the turbo happy, things get serious. You are literally slammed back in the seat at the point that the stocker starts to accelerate with authority. The car is throwing sand in huge rooster tails, and dunes that seemed large are suddenly small with the edges rushing up at you. There is a point where the stock machine runs out of breath and goes flat. At that point the Stage 6 Evo motor slams you deeper in the seat, and dunes shrink to tiny little bowls. The acceleration is seriously ridiculous. The front wheels feel light, and it is hard for your vision to keep up with what is happening. When we sampled the E85 kit, it was brand new, and the Evo team was busy working on the EFI programming to further dial in the low-rpm drivability. We have driven the Stage 6 kits with 110-octane race fuel, and they had immense drivability and smooth response, so we have no doubt Evo will have that dialed in by now. Not that it really matters, because feeling the acceleration is so addicting. Your entire outlook on dune running changes. You aren’t looking for fun lines as much as you are searching for room that will let you mash the throttle and get the boost up. Acceleration like this is a drug, and we can easily see why there are so many addicts. Despite all the power, the wide Can-Am X3 is a great platform. It still turns happily, carves lines, and handles whoops and bumps just fine. The interior holds you in place and lets you carve up the dunes with abandon. There is no doubt that gaining this sort of power, then making the car ready for that power is not a cheap exercise. 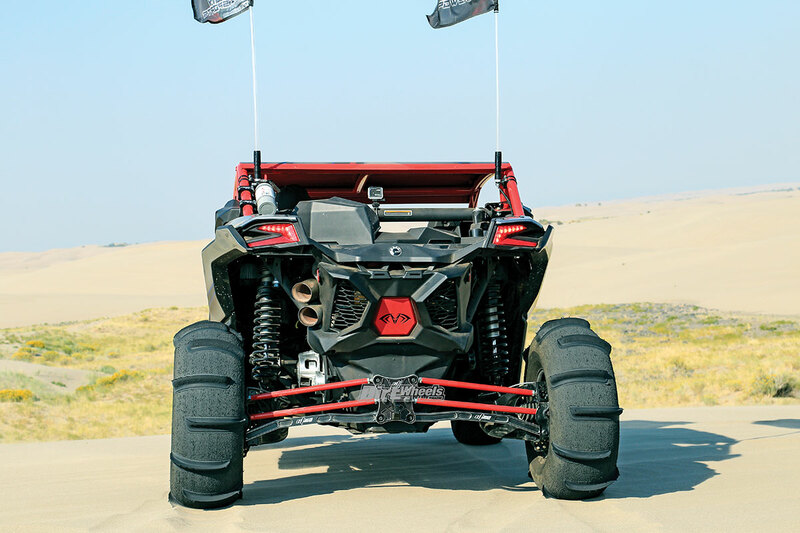 But, we were most impressed with the quality of all the Evolution Powersports parts and the beefy STM clutches that Evo runs without a cover in the dunes to get maximum belt cooling. 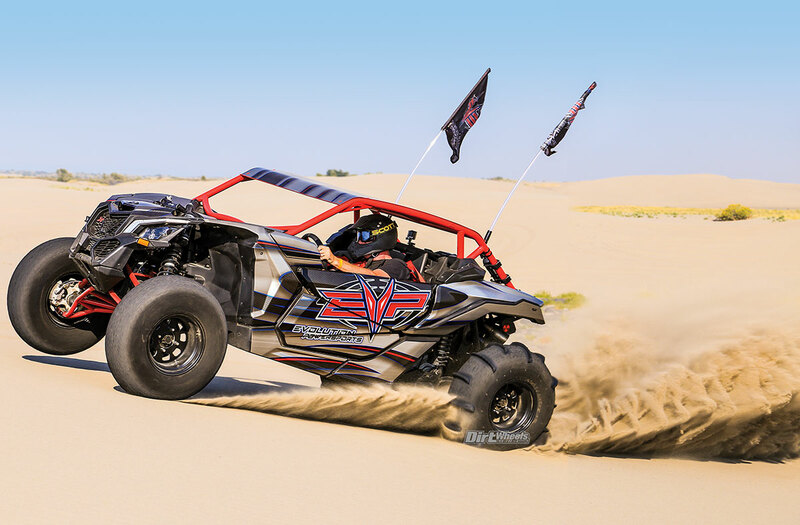 For many, motorsports is all about the thrill, and the Evolution Powersports Stage 6 Can-Am X3 is a non-stop and very large thrill. 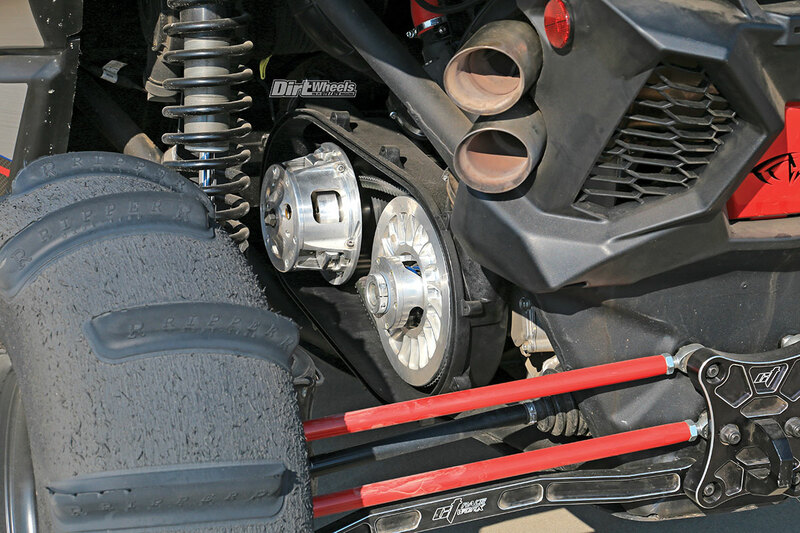 CT Race Worx makes the tough and strong rear radius rods. The bottom rods are made for extra clearance. They are helpful in the sand.